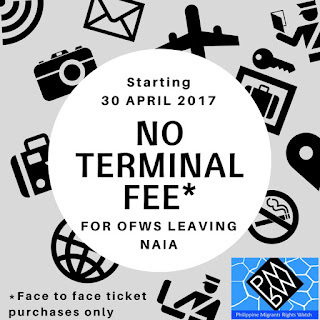 Effective April 30, 2017, OFWs need not pay for their terminal fee at Ninoy Aquino International Airport (NAIA) terminals. In the Memorandum of Agreement between the Department of Transportation and 40 airline companies operating at the NAIA signed last March 15, 2017, the International Passenger Service Charge (IPSC), also known as the terminal fee, is waived for OFWs. This is in accordance to RA 8042, also known as the Migrant Workers and Overseas Filipinos Act of 1995, as amended by RA 10022. The said IPSC waiver is also provided to pilgrims, Philippine Sports Commission delegates and others authorized by law and the Office of the President traveling outside of the country. This waiving of terminal fees starting April are for face-to-face ticket purchases, while online ticket purchases will be waived by the end of July 2017. 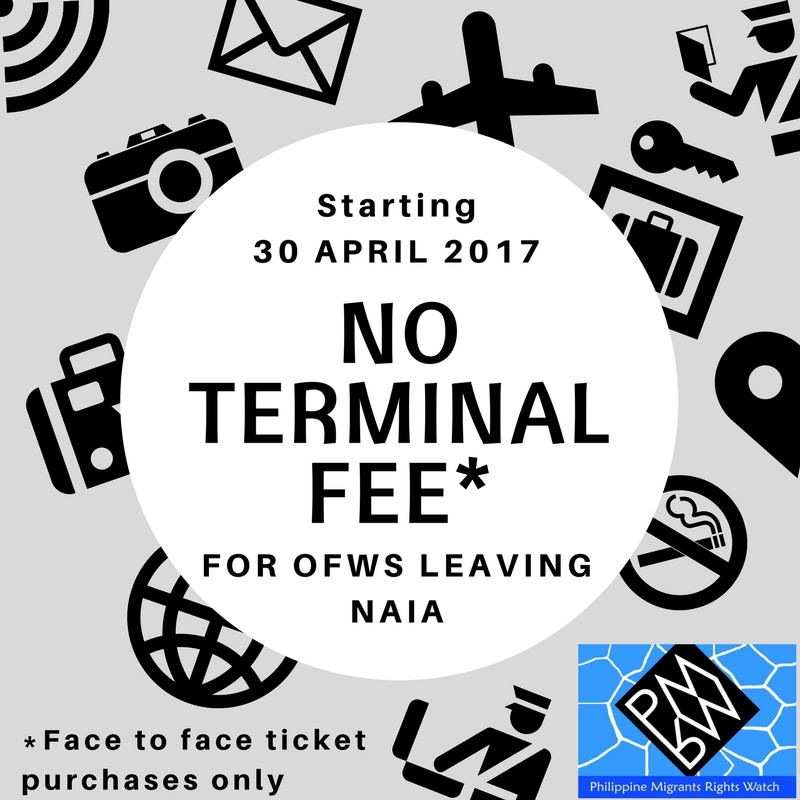 PMRW is in the forefront of advocating against integration of the terminal fee on ticket purchases of OFWs. As part of the No to 550 Coalition, PMRW is actively involved in lobbying with lawmakers and campaigning for the immediate scrapping of this fare integrating system and waive terminal fees at all modes of ticket purchase. 2015 Creative Commons. Travel theme. Powered by Blogger.